For the Left in this country, free speech doesn’t matter. 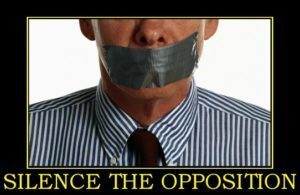 Opposing views need to be silenced. Period. Although we hear all the time, “let’s have a national conversation,” the Left really doesn’t want to hear anything other than their own voices. The latest case on point surrounds the recent shooting at the Marjory Stoneman Douglas High School. Seventeen-year old David Hogg, one of the high school students, has emerged as the poster boy for young people affected by gun violence. Laura Ingraham, host of the Ingraham Angle on Fox News, welcomed Hogg on her show right after the shooting. He was later interviewed by TMZ and said he had been rejected by four UC schools. Ingraham tweeted “David Hogg Rejected by Four Colleges to Which He Applied and whines about it. (Dinged by UCLA with a 4.1 GPA…totally predictable given acceptance rates.” (Why she did this, I have absolutely no idea. She wasn’t debating his view on the shooting, gun control, NRA, March for Our Lives. His ability or inability to get into a university is irrelevant.) But, she hurt his feelings and, miraculously, in a matter of hours, he was able to obtain a list of her sponsors and started a Twitter storm asking them to cancel their advertising. Not surprisingly, she apologized when Fox’s wallet started to be affected. But that wasn’t enough. The Left doesn’t want her apology. They want her voice silenced. Boycotts aren’t enough. They want sponsors to stop their advertising, the end game being the cancellation of her show. Clearly, being manipulated by the Left, he wants her to “denounce” a view with which he doesn’t agree. In other words, he wants that opposing view silenced. There are so many things wrong with this situation, where do I begin? First of all, no matter what grade point average this kid has, he’s not smart enough to so quickly obtain a list of Ingraham’s sponsors on his own. So who did provide Hogg with the list? Second, who was behind the “March for Our Lives?” Within days, March for Our Lives became a registered a 501(c)(4) nonprofit advocacy organization that is not required to disclose its donors. So who’s providing the financial backing? George Soros? Media Matters? Finally, here’s some advice for Hogg: You’ll be 18 soon. If you want to stay in the national limelight, you better grow a thicker skin because life is going to get a helluva lot harder. You shouldn’t be on the national stage if you don’t want to be attacked or challenged, and, you should stop personally attacking others. And, whatever you do, recognize that you’re a pawn for the Left. The only time I heard a call for a boycott by the Right was against the Target Corporation for its transgender bathroom decision. Target is still standing. On a personal note, there are many people with whom I disagree: Rachel Maddow, Joy Behar, Anderson Cooper, etc. I don’t like what they have to say, so I don’t watch their shows. I’ve never written a letter asking for them to be fired or contacted their sponsors to cancel advertising. This is America. People have a right to express their opinions. I’ve never asked for their voices to be silenced. I’ve seen this type of manipulation by the media and I’ve seen “friends” on Facebook personally attack other “friends” because of their views. Even here on the Island where I live, citizens have called for boycotts of retailers who won’t denounce the NRA. In America, we don’t shut down someone’s voice because we don’t like what they’re saying. But that’s exactly what the Left is doing. It’s all around us if we’re willing to open our eyes. It’s not only wrong but extremely dangerous to this country.